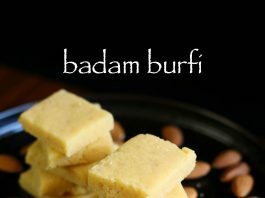 badam burfi recipe | almond burfi recipe | badam katli recipe with detailed photo and video recipe. a popular indian sweet recipe prepared with powdered almonds and sugar syrup. it is typically served as a dessert after full main course meal, and even prepared during any major indian festival. 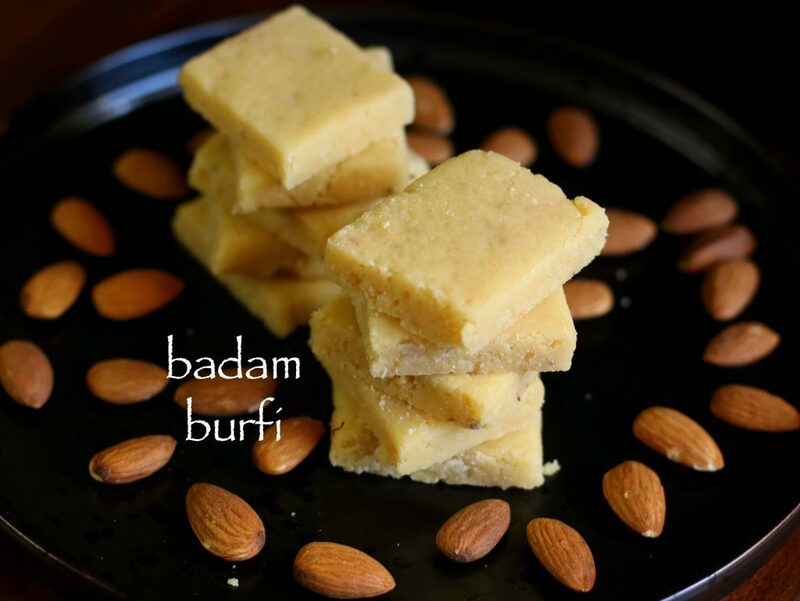 badam burfi recipe | almond burfi recipe | badam katli recipe with step by step photo and video recipe. basically the dish is prepared by soaking almond in warm water which is followed by de skinning them. it is then grounded to fine powder, or even to thick paste with milk. 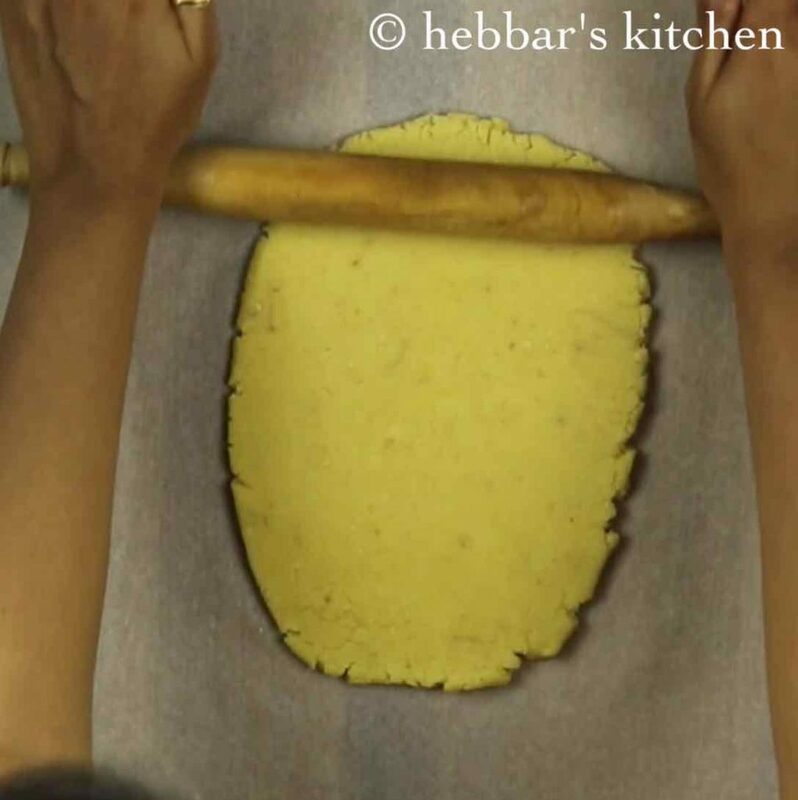 later the paste is then mixed with sugar paste which basically gives a barfi or any desired shape. katli recipes are usually prepared during festival like diwali, navaratri and even during ganesh chaturthi. i have already shared the recipe of kaju katli, which is very similar to badam katli recipe. to be honest i have prepared this recipe exactly same the kaju barfi, but replaced with almonds in place of cashews. but the main difference between these 2 recipes is with thickness of barfi. with almond barfi the thickness can vary and is completely open ended. whereas, for kaju katli it is always recommended to be thin in shape. moreover, kaju katli has to be rolled immediately after you take it from pan. but luckily with almond barfi, you can knead it after 3-5 minutes after you switch of the flame. 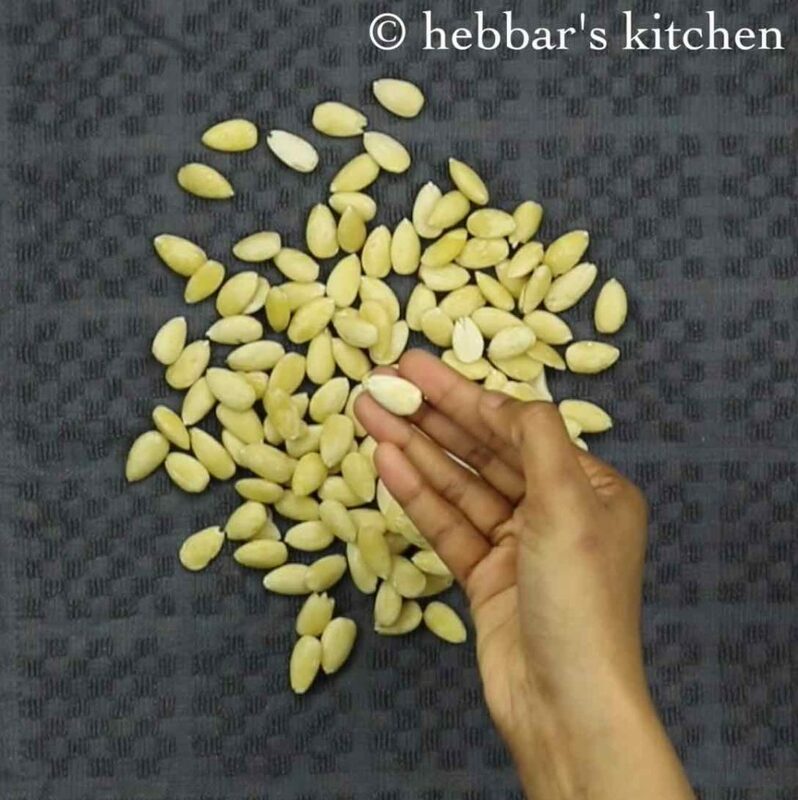 furthermore, some important tips and suggestions for a perfect badam katli recipe. firstly, 1 string consistency is very important to get proper texture and taste. 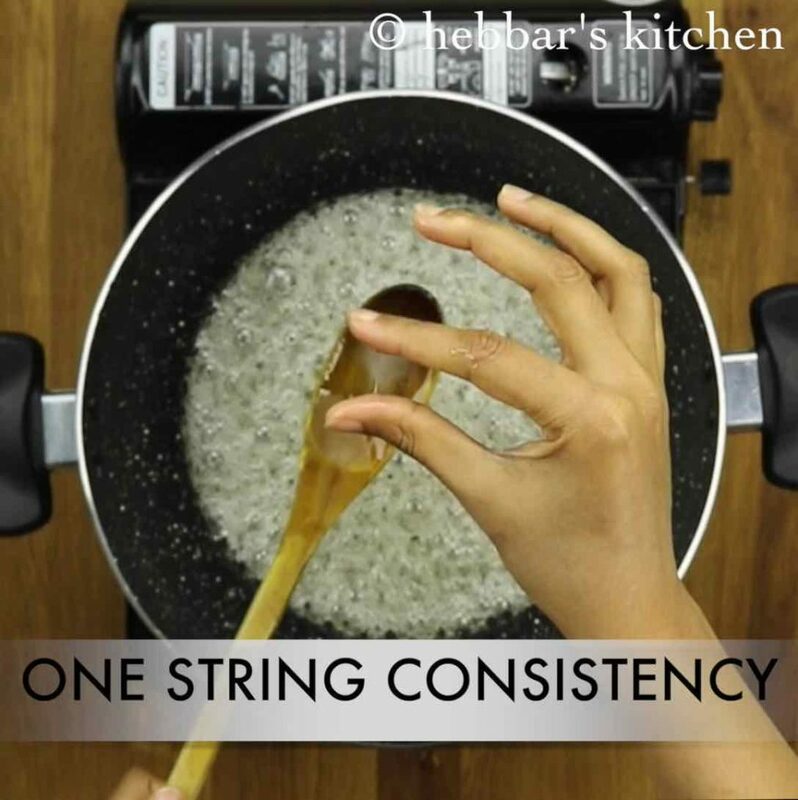 keep checking and stirring before you achieve one string consistency with sugar syrup. secondly, you have to be very attentive while stirring the badam paste with sugar syrup. switch off the flame immediately and pour into a butter paper. if you miss a fraction of seconds, than you may end up with brittle powder. lastly, i have grounded the almonds to fine powder after soaking. you can also ground them with milk to fine paste and pour them onto sugar syrup. firstly, in a large bowl soak almonds in hot water for 1 hour. now slowly peel the skin from badam and keep aside. 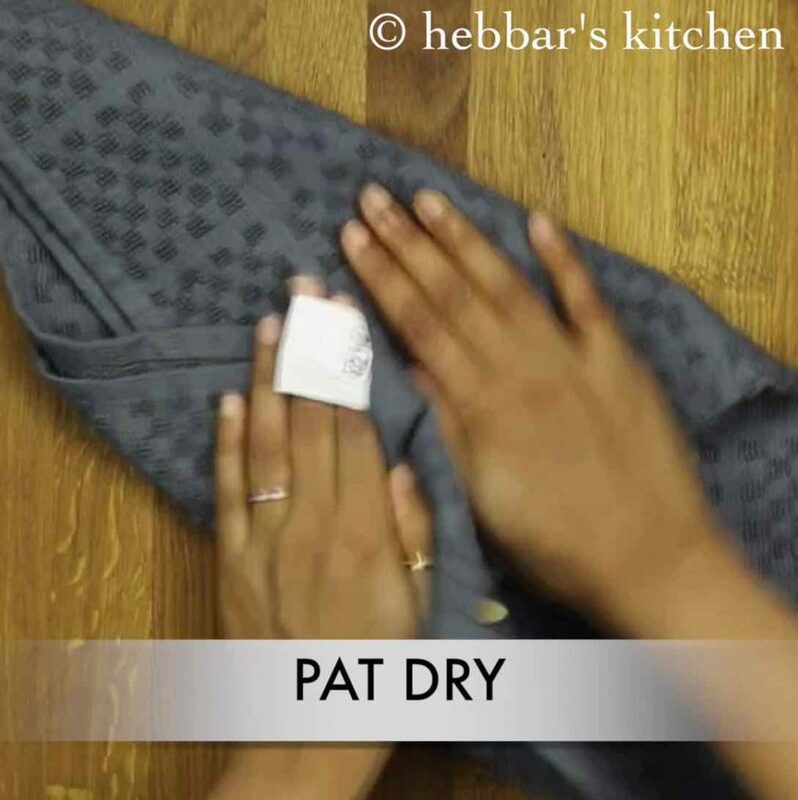 also pat dry the badam making sure there is no moisture present. 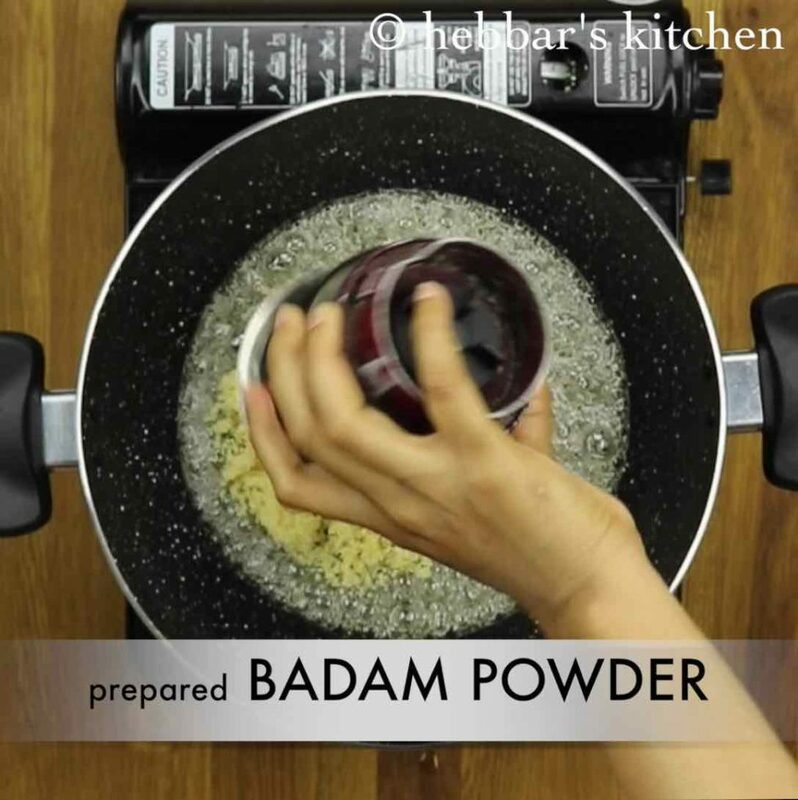 transfer the badam into a small blender and blend to coarse powder. keep aside. 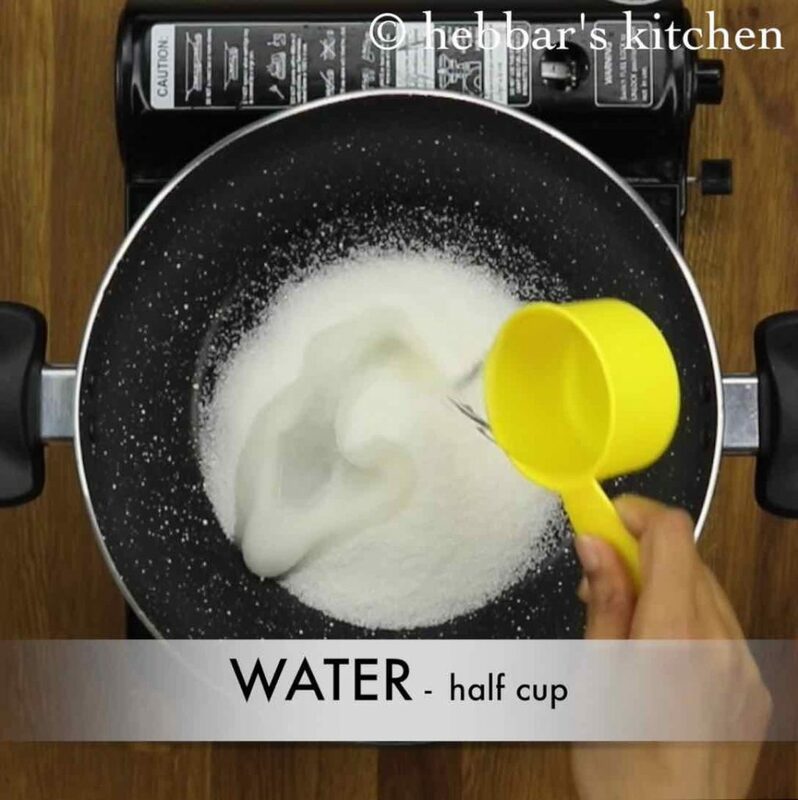 meanwhile, prepare the sugar syrup by adding ¾ cup sugar and ½ cup water. boil the sugar syrup till it forms one string consistency. now add the prepared almond powder, saffron milk and cardamom powder. mix continuously keeping flame on low to medium. continue to mix continuously till the mixture starts to leave the pan. 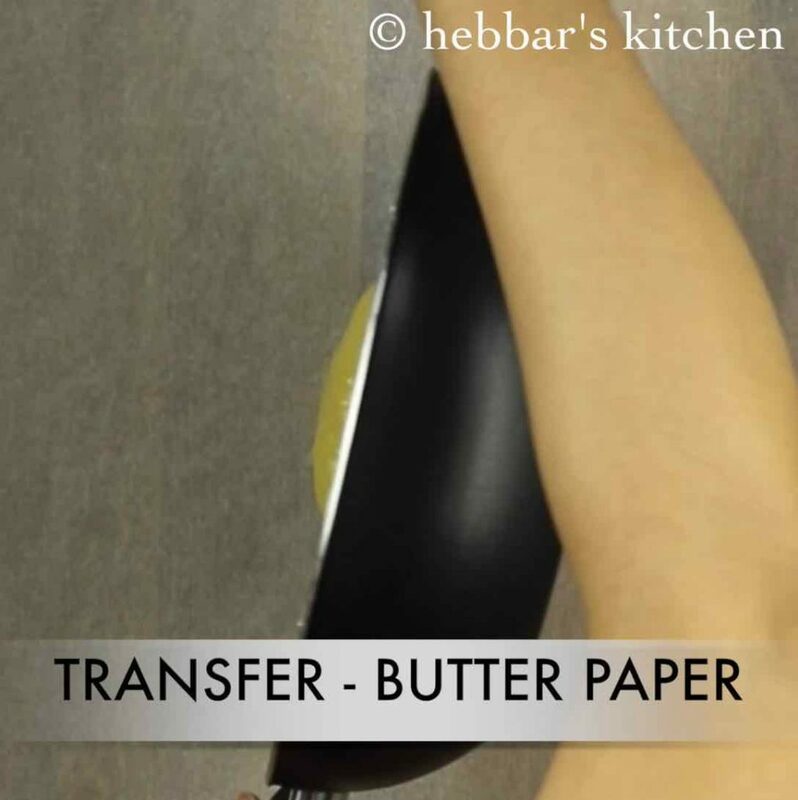 transfer the badam dough onto the butter paper. 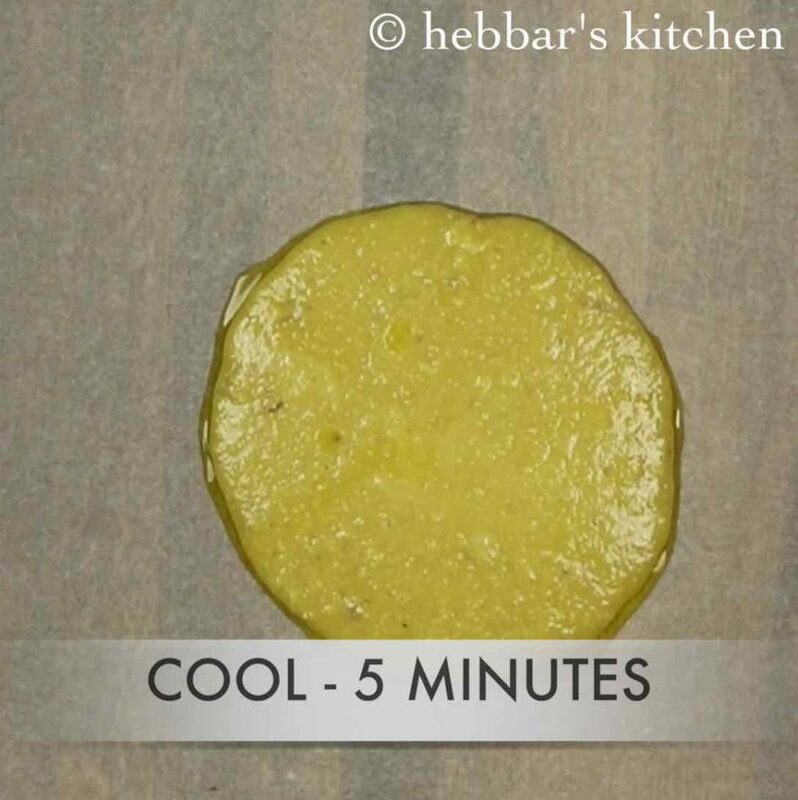 and allow to cool for 5 minutes. grease your hand with little ghee and knead for a minute. 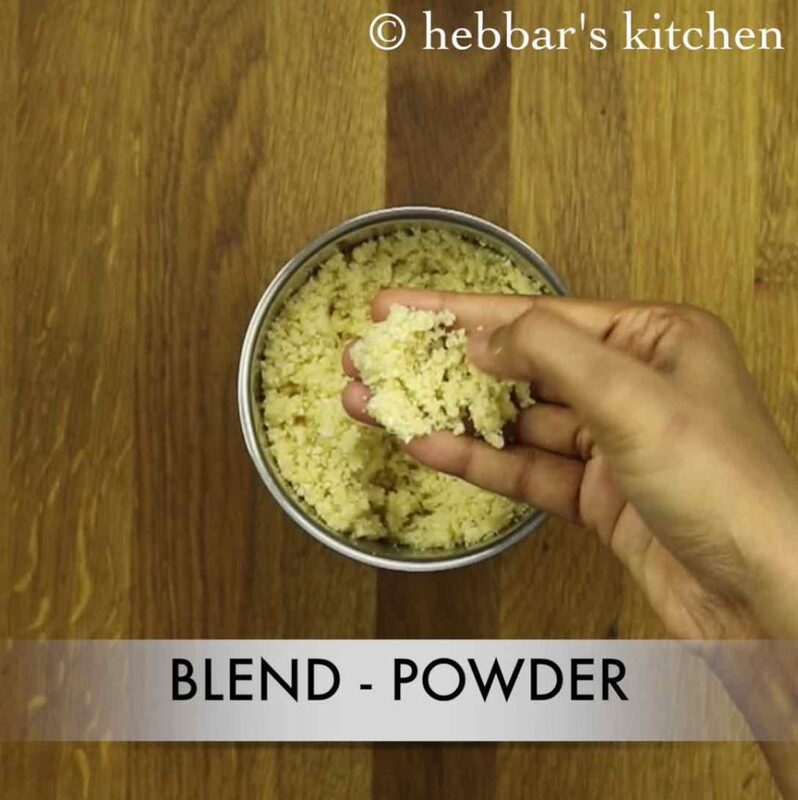 once you get smooth dough, roll the dough with a rolling-pin,. 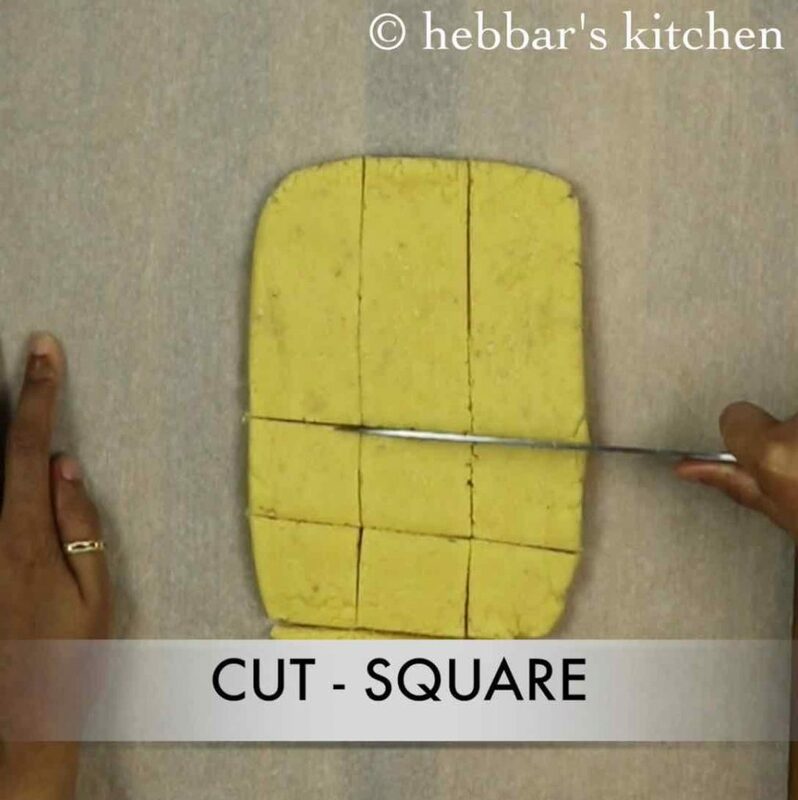 furthermore, cut the dough into square shape or the shape you wish for. you can also decorate with silver leaf / silver vark. finally, serve badam burfi / badam katli on diwali or any festival. 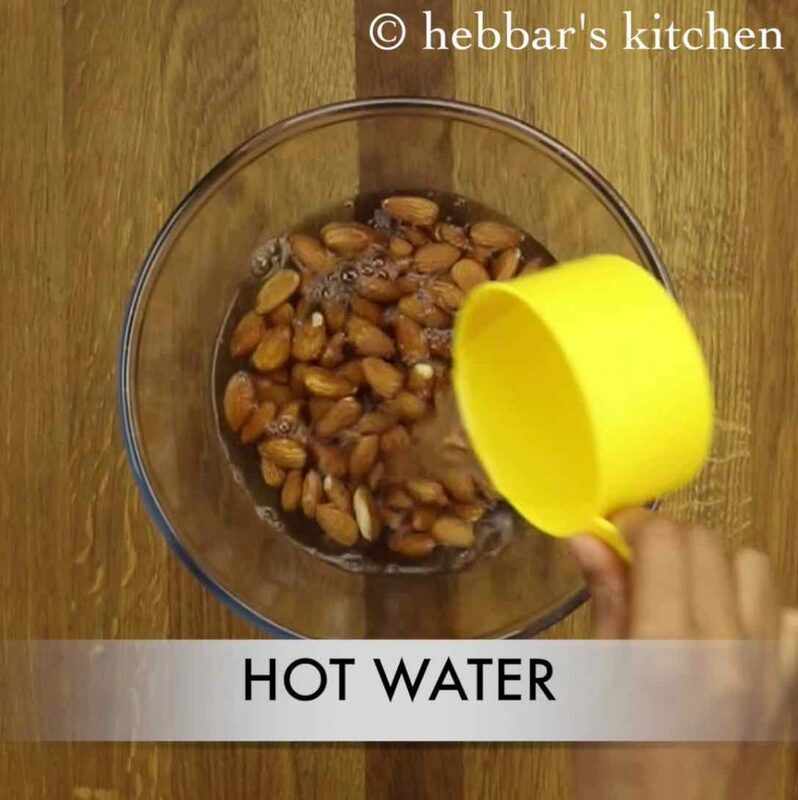 firstly, in a large bowl soak ¾ cup of almonds in 1 cup of hot water for 1 hour. now add the prepared almond powder. also add saffron milk. 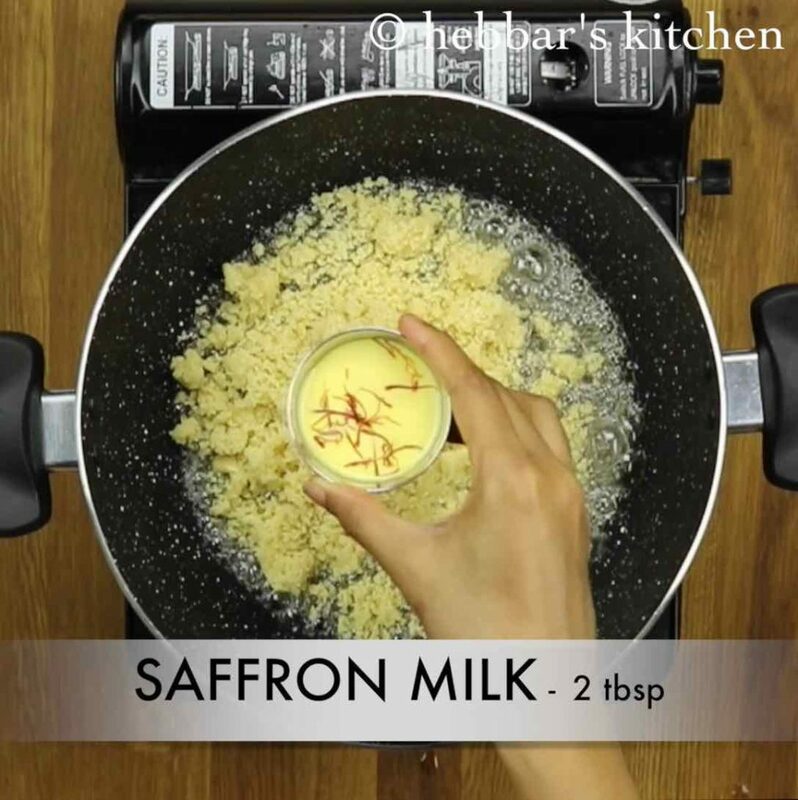 to prepare saffron milk, soak few strands of saffron in warm milk for 10 minutes. 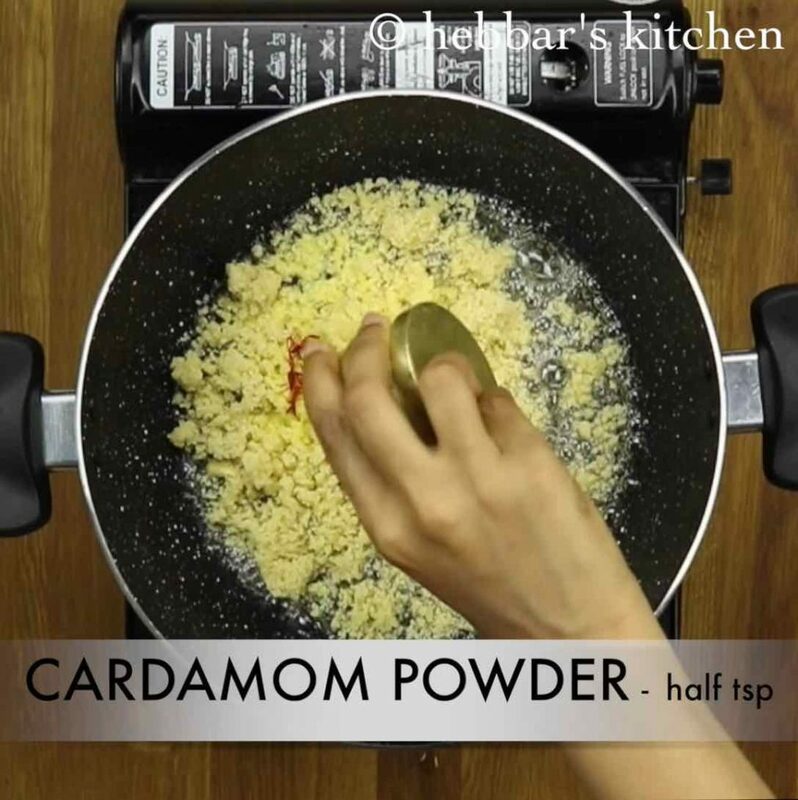 additionally add cardamom powder for more flavours. 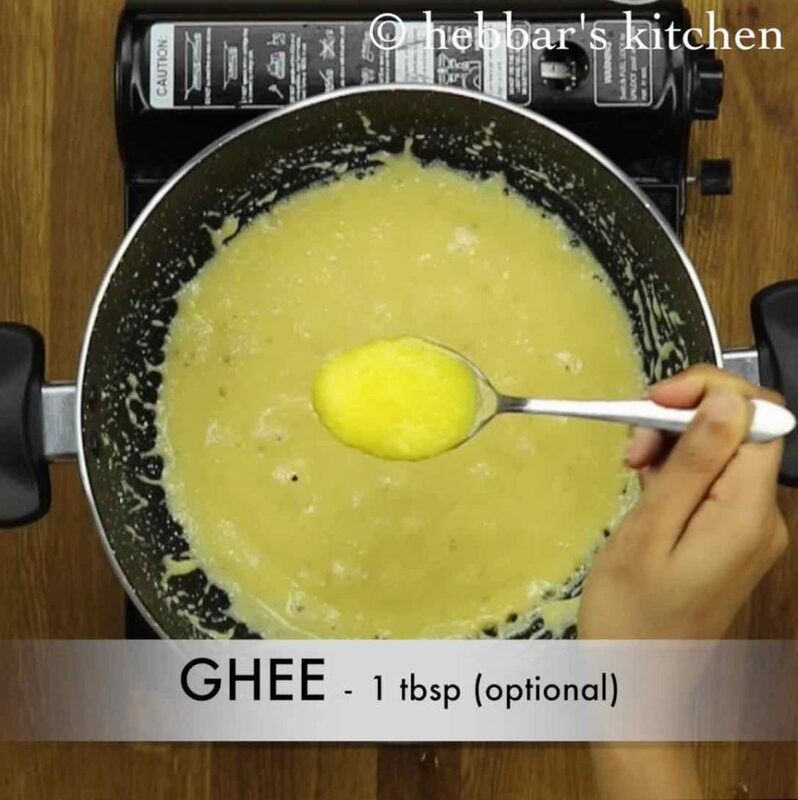 once the mixture begins to boil, add a tbsp of ghee. however, it is optional, but do add more flavour to burfi. 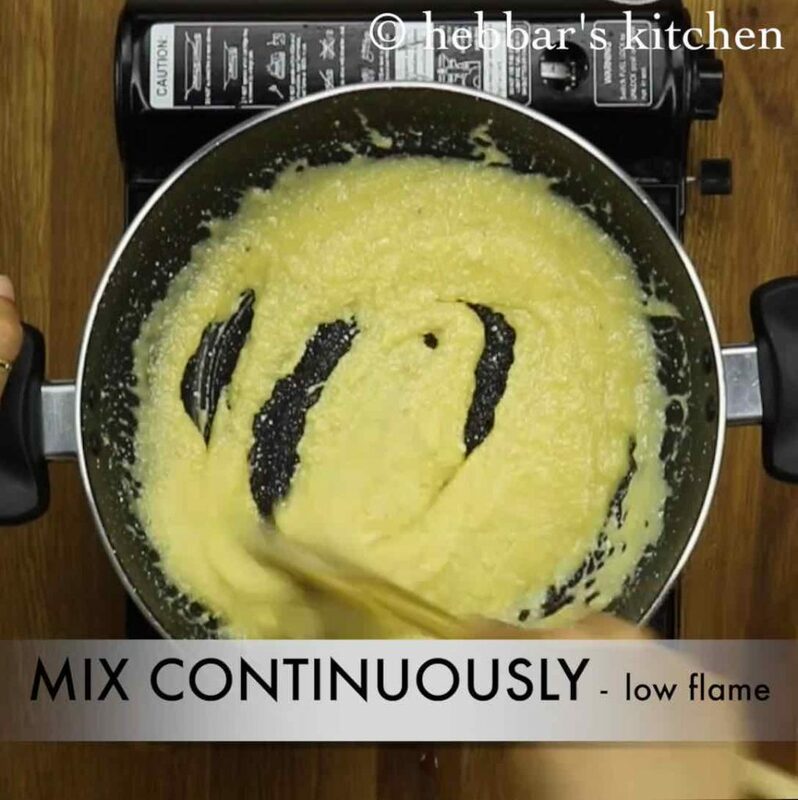 continue to mix continuously till the mixture starts to leave the pan. 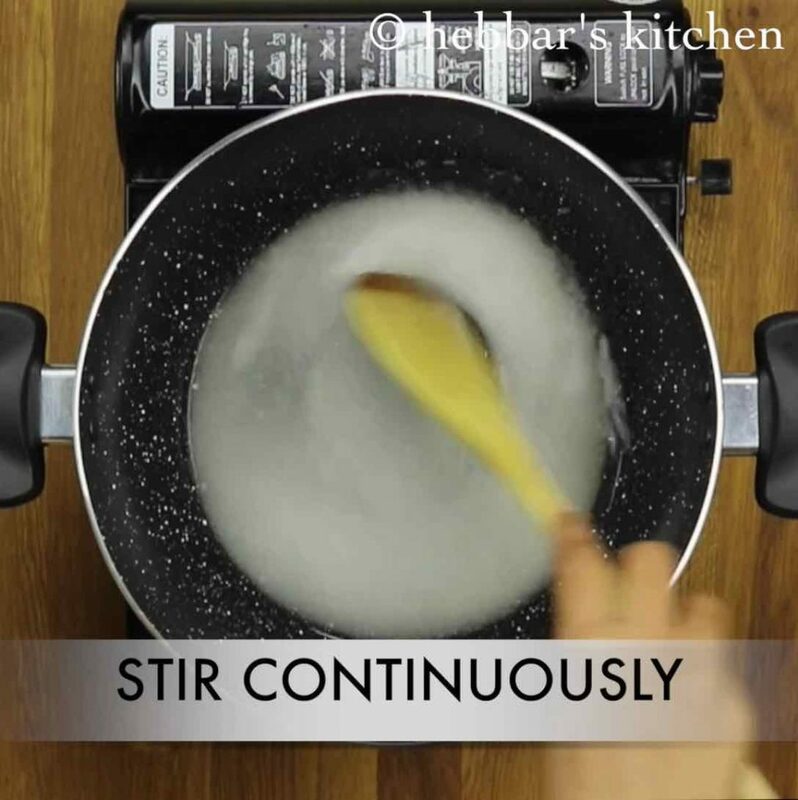 if you prefer slightly hard burfi then continue to stir for longer time. 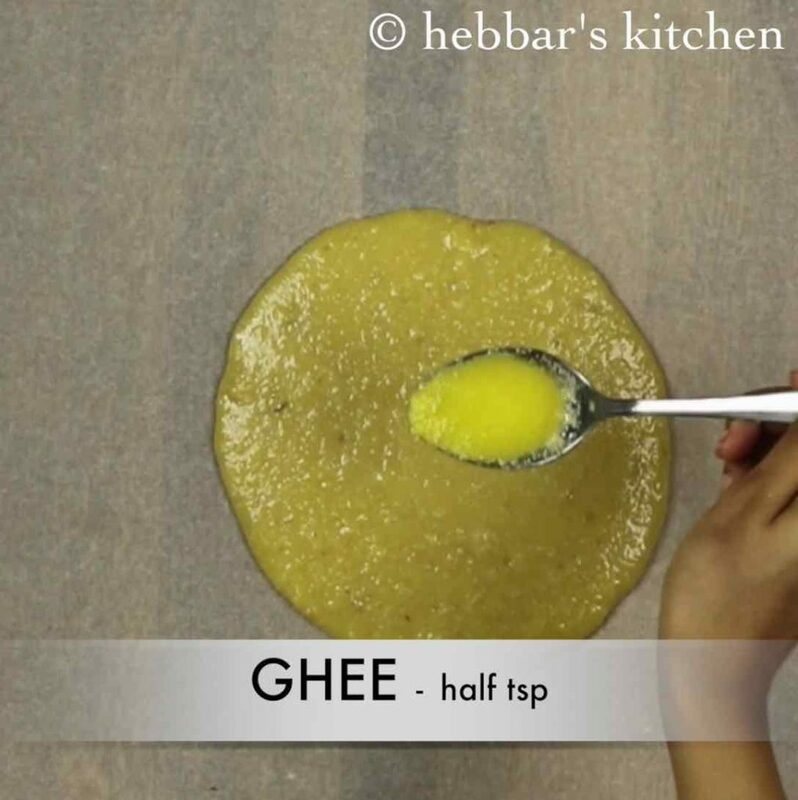 add a tsp of ghee to make smooth dough. and allow to cool for 5 minutes. do not rest more, as they will turn hard and wont be able to give shape. grease your hand with little ghee and knead for a minute. be careful as the dough will be very hot. 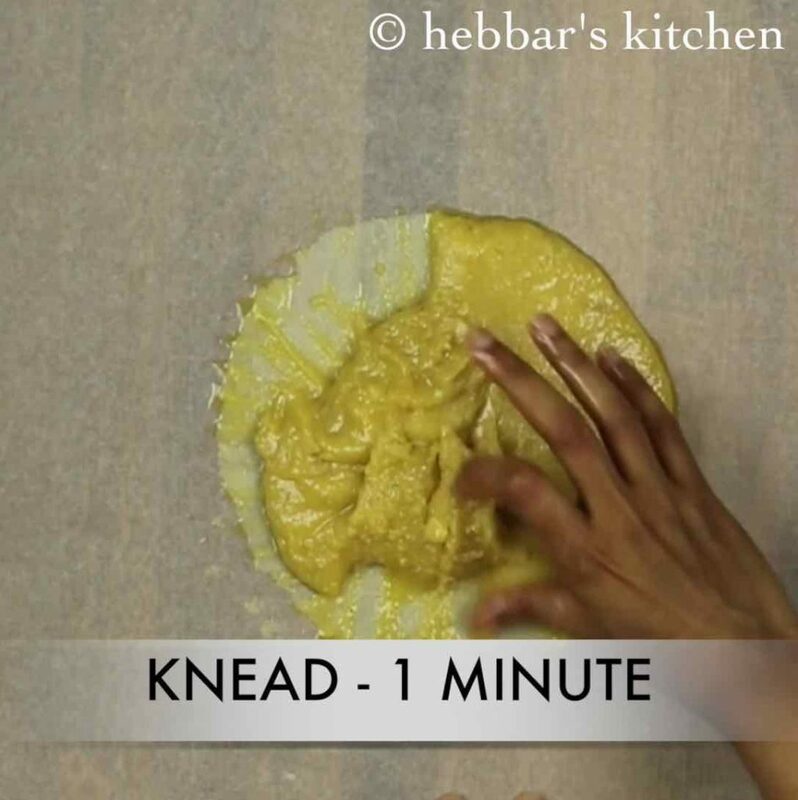 try to knead when its hot, else it will be difficult. and do not over knead as badam will start releasing oil. once you get smooth dough, roll the dough with a rolling-pin, adjusting the thickness according to your choice. firstly, soak the badam well, or blanch the badam for easy removal of skin. also, make sure to get just 1 string consistency of sugar syrup. else it turns burfi hard and brittle. 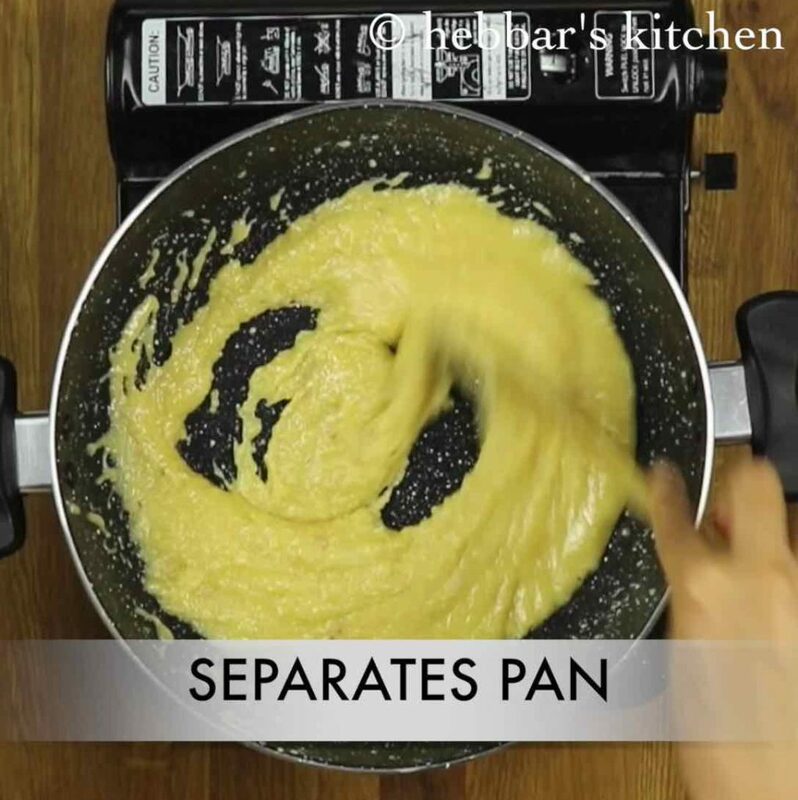 most noteworthy, use nonstick pan for easy and efficient badam katlis. and entire badam burfi has to be prepared on low flame. 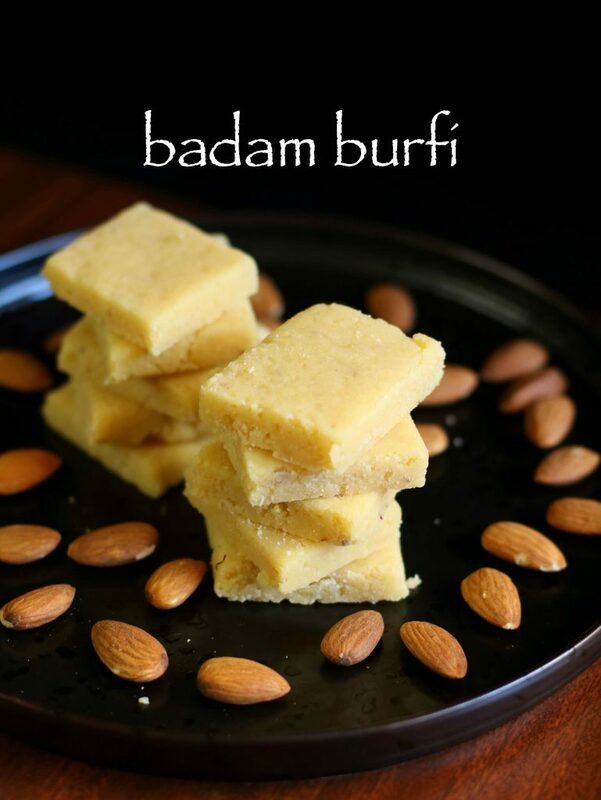 finally, instead of butter paper you can also use plastic sheet or greased plate to prepare badam burfi / badam katli. Superb recipe..i tried today…it came out very well! Can i use a ready made almond flour? Thanks for the wonderful and simple recipe. tried to make this today but consistency was still loose. I couldn’t make dough like yours. What did I do wrong? Can you please tell me? Thank you! The only problem i can see is the sugar syrup consistency. perhaps the sugar syrup was not having the one string consistency?